The Goods and Services Tax (GST) is set to kick off in April in Malaysia, and petrol is not going to be on the exempted list of basic necessities according to Royal Malaysian Customs Department senior assistant director Ishak Daud in Kuala Lumper recently. He was quoted that the 80 or so items that will be exempted would be revealed in October at Malaysia's 2015 Budget. Currently, both RON 95 petrol and diesel are exempted from the sales tax which the 6% GST is supposed to take over from. 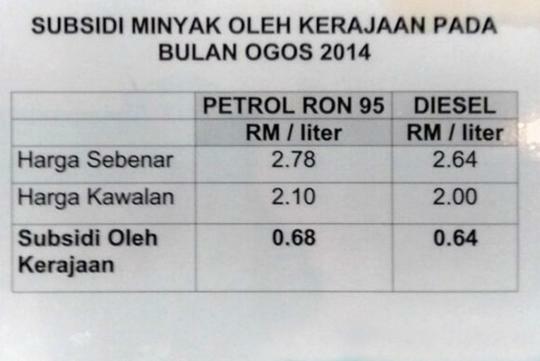 Assuming the rate of fuel subsidy, which RON 95 petrol and diesel enjoy from the government now stays the same, expect their price to increase after April 2015. RON 97 prices would not be affected since the subsidy is minimal and is driven by market forces. Malaysia everything also must match SG. SG got VEP. MY also must have VEP. Malaysian come SG shop, need to pay 7% GST. So Singaporean go MY shop also need to pay GST.